Organic pomegranates and a roast chicken dinner! Working on a farm definitely has its perks. Not only do we get to enjoy the beautiful scenery here at Ganico Organic Estate, and spend our lunch breaks walking through their pomegranate orchard, but we also get first pick of the amazing produce that grows on the farm and the artisanal products that are made here! So this week, you’ll find some beautiful, freshly harvested, organic pomegranates in your boxes, as well a jar of Ganico organic pomegranate drizzle, made right here on the farm. And for our lucky Maxi Box customers, you also get a jar of pomegranate blossom honey, the last of this season’s batch! Ganico is first and foremost an organic pomegranate farm, but they are on a mission to make their farm as diverse as possible. They have started growing lemons, gooseberries and granadillas, and they also make some special, handcrafted, artisanal products, like the amazing pomegranate drizzle in your boxes this week. We love being so close to the source of our food, knowing exactly where it’s come from, and how it’s made, and we hope you’re enjoying all this farm fresh goodness in your boxes! And, the cherry (well, pomegranate gem) on top, is that there’s also a special pomegranate recipe, just for you. 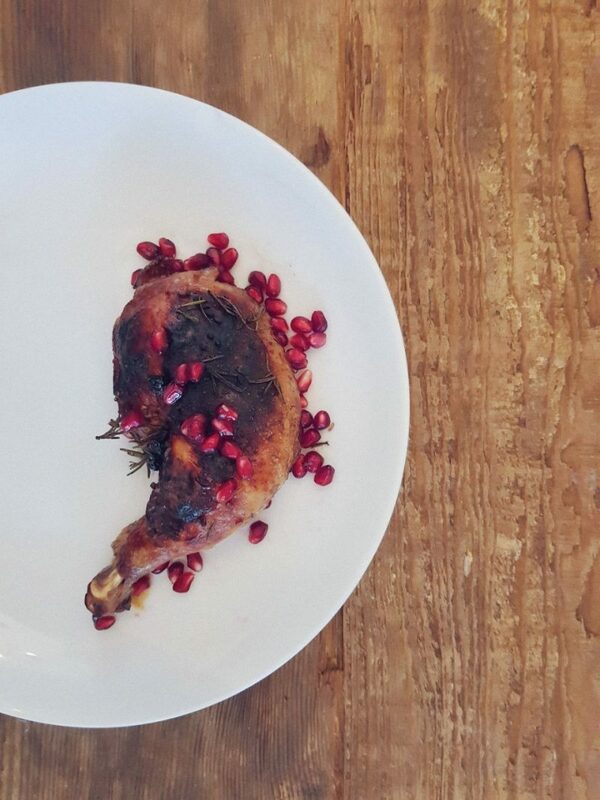 Laiken & Jason Cullen, the brains behind this beautiful farm, made a roast chicken, with pomegranate drizzle & fresh pomegranate arils, and we hope you’ll give it a go!